It's been more than a year since the last episode of Breaking Bad aired, leaving fans to stew for months over how Walt and Jesse were going to get out of their latest bind. When last we saw them, our favorite meth cooks tried to get them upper hand over their boss by eliminating fellow cook Gale to ensure their place in the organization as the only available producers of high-quality product. This calculation was not wholly inaccurate, but crime bosses like Gus aren't the type of guys that like being forced into situations and Walt and Jesse have definitely stirred a mighty beehive. Season four's premiere episode, "Box Cutter," is an exquisite exercise in tension and the episodes that follow keep this up as every major character seems to have a passed a major breaking point. Desperate to maintain control of his fate, Walt continues to entertain further notions of criminal activity, skipping towards black hat territory with a disturbing amount of pleasure. Jesse is putting on brave face, but having killing Gale has clearly damaged him. Continuing with their plans of purchasing the car wash, Skylar is getting more involved with her husband's illicit activities. And, of course, Hank, still struggling with his injuries, is taking out all of his frustration on Marie, who can only take so much. Every note of these opening episodes is pitch perfect, building a slow crescendo of what looks to be an impressively strong season. It's especially great to see Skylar become more immersed in the business. Anna Gunn has always been great but the show has occasionally struggled to find a place for her and she really blossoms as she takes control over the business side of Walt's criminal enterprise. Interestingly, the Whites' son, Walter Jr. is missing in the season's first three episodes and it will be curious to see how his parents his manage to keep their secrets from him now that they're both involved. The long wait proves well worth it as the fourth season of Breaking Bad continues to prove that this is one of the best shows on television. 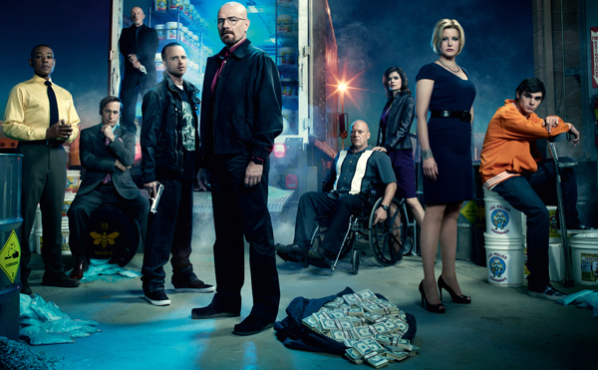 Breaking Bad airs tonight at 9pm on AMC.